Whale Sharks, one of the largest creatures on earth, are preparing to descend on Belize for their annual migratory stopover, and according to The Lodge at Chaa Creek, travellers looking for an unforgettable experience should start making plans to take part in this annual spectacle with a unique all inclusive Belize vacation package. where else can you combine a whale shark adventure with exploring a pristine rainforest and ancient Maya temples? Belize’s Caribbean coast offers a rare opportunity for people to get up close and personal with one of the largest creatures on earth, and The Lodge at Chaa Creek is once again assisting travellers to take advantage of the gentle behemoth’s spectacular annual visit with a unique all-inclusive Belize vacation package, according to the popular eco resort’s natural history centre. And no, the creature in question is not a whale. According to Brion Young of Chaa Creek’s Belize Natural History Centre, whale sharks are the largest fish on the planet, and observing them in the wild is an unforgettable sight. “To see these huge, gentle creatures in the wild is an incredible experience, and Belize, being one of the few countries in the world to host an annual whale shark migration, offers a rare opportunity to do this. The warm, crystal clear Caribbean waters, sheltered by the barrier reef, make whale shark excursions a comfortable and safe experience for people of all ages and levels of fitness,” Mr Young said. “Since anyone can remember, Sapodilla Tom, as whale sharks are called here, have been regularly visiting Gladdens Spit and the Sapodilla Cayes near Belize’s Great Barrier Reef to gorge themselves when mutton and dog snappers spawn, making Belize one of the few places on earth where people have a good chance of hanging out with them,” Mr Young explained. 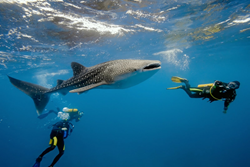 To coincide with the whale shark migration, each year Chaa Creek offers tours and vacation packages to give guests a chance to see the massive fish, he added. “This year Chaa Creek has once again partnered with Robert’s Grove in Placencia to offer the Whale Shark Adventure all-inclusive Belize vacation package, which offers people a chance to get close to these magnificent animals while enjoying a very full yet relaxing Belizean holiday,” Mr Young said. Chaa Creek’s Whale Shark Adventure is being offered this year during April and May, and again in June, Mr Young explained. The spring portion will be available April 25 to 30, 2016, and May 21 to 31, with a summertime option offered for June 20 to 28. Due to the growing popularity and narrow window of time for whale shark visits, travellers should consider booking now to avoid disappointment, Mr Young advised. The limited time, all-inclusive Belize vacation package takes guests from Maya temples and inland rainforests to Belize’s Caribbean coast with stays at both Chaa Creek and Robert’s Grove. All transfers, accommodation, full breakfasts, lunches and dinners, activities and everything else for a complete vacation at both resorts are included for one set price, Mr Young explained. While at Chaa Creek, guests will enjoy three nights eco-luxe lodging with farm-to-table dining in the onsite Mariposa restaurant, a trip to the Belize Zoo, visits to the ancient Maya temple at Xunantunich and ceremonial caves at Barton Creek, a choice of zip lining and cave tubing in Belize or an excursion to the ancient Maya city of Tikal in neighbouring Guatemala, guided tours of the Belize Natural History centre and Butterfly farm, with canoeing, nature walks, swimming and other activities within Chaa Creek’s 400 acre private nature reserve. The Robert’s Grove portion of the Belize vacation package includes four nights accommodation, a full meal plan with breakfast, lunch and three course dinner, two days of a choice of whale shark snorkelling or scuba diving with two tanks per day, a day of reef snorkelling or scuba diving with two tanks and all dive gear included, as well as use of the resort's three swimming pools, canoes, kayaks, windsurfers, Hobie Kats, gym, and bicycles. Robert’s Grove provides all air and land transfers to their Caribbean seacoast location where guests are greeted with a welcoming cocktail, Mr Young said. “Robert’s Grove shares our philosophy of excellence combined with environmental responsibility, and by partnering with them we’re confident of being able to offer the most comprehensive, comfortable and affordable whale shark excursion available anywhere. It’s a rare opportunity to take in Belize’s pristine rainforests and rich ancient Maya heritage while seeking out one of nature’s largest and most beautiful creatures,” Mr Young said. Although understandably mistaken for a whale due to its size, docile nature and feeding habits, the whale shark, or Rhincodon typus, is a true shark, and the world’s largest fish, with a recorded length of 12.65 m (41.50 ft) and a weight of more than 21.5 metric tons (47,000 lb), although larger specimens have been reported. Relatively unchanged over the last 60 million years and larger than a school bus, the mammoth creatures are filter feeders, drawing water though mouths four and a half feet wide to strain plankton and other nutrients, much as many species of whales do. They are regularly seen laying on the sea floor and don’t seem to mind interacting with humans. Three or four days before and after the full and new moons in April and May are the best times to see whale sharks, with the Gladden Spit area (about 26 miles off the coast of Placencia where Robert’s grove is located), a favourite spot for the hungry world travellers, who gather in large concentrations when mutton and dog snappers are spawning. And while Madagascar, South Africa, Australia, Mozambique, Indonesia and the Yucatan are also some of the few places to host regular whale shark migrations, Mr Young counts Belize as among the very best. “We’re very fortunate in Belize to have such perfect conditions to host whale sharks, as well as the perfect conditions to see them. With calm, protected clear waters, generally excellent weather and a wealth of local knowledge, Belize must rank among the best of the world’s few spots where whale sharks migrate to,” Mr Young said, “And where else can you combine a whale shark adventure with exploring a pristine rainforest and ancient Maya temples and cities while enjoying exquisite dining, luxurious amenities and so many exciting activities? “Whale sharks are truly some of nature’s most magnificent creations, and I like to think that we do them justice with our Whale Shark Adventure Belize vacation package,” Mr Young said, adding that people can contact their travel agents or Chaa Creek directly for bookings and enquiries.